Print out forms in the comfort of your own surroundings and complete fully. Or Call us now at (949) 274-8399. 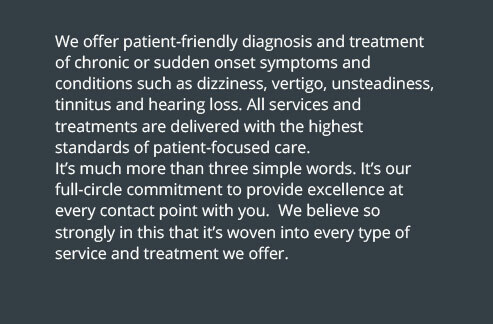 We understand the difficulties and challenges of living with dizziness and balance disorders, probably better than anyone. Bottom line is we’re here to help. To learn more about our Institute and how we can restore your hope for living safe, dizzy-free and feeling better, call (949) 274-8399. The human body is a miraculous machine that maintains your balance and equilibrium. When functioning normally it flawlessly facilitates all tasks necessary for everyday living. That means you can walk around comfortably and confidently, without feeling dizzy. Vestibular: The labyrinth is the minute, inner-ear organ and structures that continuously detect and adjust for gravity, as well as vertical/horizontal motion and rotation of the head. GENERAL EXERCISES. AVT is often more effective than non-targeted PT (physical therapy) or OT (occupational therapy) exercises because it targets and treats specific problematic areas within the visual, somatosensory and vestibular systems. MEDICATIONS. Medicines may temporarily relieve discomfort by suppressing the vestibular system, but alone, they fail to address underlying physiological causes. For many, AVT is better than medications alone. SETTLING FOR ONLY PARTIAL RELIEF. Many times after dizziness subsides, patients convince themselves that they feel a little better and stop seeking a long-term solution. This makes them even more vulnerable to future episodes and to harmful or potentially fatal falls. DOING NOTHING. With time, your dizziness may subside on its own. But that doesn’t mean your condition is gone. If the cause is viral, symptoms will recur each time the virus is activated. Individualized AVT, administered by Dr. Mango and his doctors of audiology, can be effective in preventing future relapses. If you’re living with sudden or unexplained dizziness, vertigo or balance disorders, we know the simple things in everyday living can leave you feeling uncertain and at times, hopeless. We share your goal: restoring your balance so you can resume the activities you love and enjoy life. Our Institute’s proprietary approach is known as Advanced Vestibular Treatment™, or AVT. What is Advanced Vestibular Treatment? This proven and personalized program is significantly more effective in resolving vestibular disorders than traditional therapy options, medications or general balance exercises alone. Is Advanced Vestibular Treatment (AVT) the same as vestibular rehabilitation therapy (VRT)? All are considered forms of therapy. However, AVT is a highly effective and far superior form of vestibular rehabilitation, and has shown to outperform traditional VRT (physical/occupational therapy) with its lasting results. AVT targets and treats specific problematic areas within the vestibular system and how they correspond with the visual, somatosensory and neurological systems, not merely the somatosensory system. Years of successful AVT results reveal that 93% of patients completing AVT have success, and don’t live with vertigo, dizziness or imbalance anymore. Its longevity is based on teaching the brain to fix itself by taking advantage of the brain’s natural plasticity and ability to restore symmetry and sensitivity. Successful AVT improves each patient’s overall stability and motor control. The eyes play an important role, as each patient’s vestibuloocular reflex (VOR) is studied, strengthened and ultimately, enhanced. Our treatment combines physical and ocular exercise movements that target and develop those weakened response areas. Personal AVT therapy and treatment is based upon the results of your auditory and vestibular evaluation and recommendations. We follow a clinic-directed approach that may include personalized home-based exercises. Typically, patients visit our Institute once or twice a week for up to six weeks or until their balance has returned. Overall success and outcome can be determined by many factors, including physical health, age, cognitive abilities, presence of existing disorders, and compliance with any prescribed home-exercise program. If you’re suffering from frequent or unexplained bouts of dizziness or vertigo, you might be a candidate for this remarkable treatment option. Many people experience symptomatic relief in just one session. 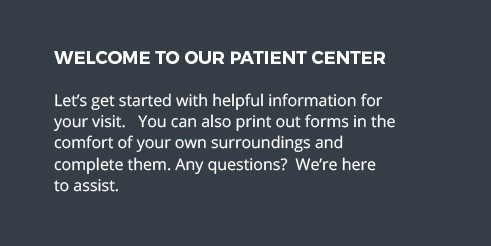 We’re pleased to offer Institute patients of all ages options that create faster and most accurate test results, greater comfort with shorter and potentially, fewer treatments. To learn more about vertigo treatment featuring Epley Omniax, please call us at (949) 274-8399. The only Institute in Orange County to diagnose and treat using the Epley Omniax multi-axial rotational chair. We are the only private practice in the U.S. with 3 Epley Omniax chairs, and among only 20 chairs nationwide. Developed by neurotology pioneer Dr. John Epley, Epley Omniax is the only system of its kind approved by the FDA for treating balance disorders and positional vertigo, including benign paroxysmal positional vertigo (BPPV), the most common cause of dizziness. All six semi-circular canals of the inner ear are treated using 360° rotation. Many patients report feeling better after just one treatment session. Deep inside your inner ear canals are tiny natural structures called otoconia (also known as crystals or particles). When properly positioned, these particles help maintain balance. Vertigo and dizziness problems start when these particles come loose and start floating within the ear canal. The number of particles and canals (multiplied by two for both ears), combined with the inherent anatomical complexities of the inner ear, can make diagnosis and treatment more difficult. The challenge is compounded by traditional, often awkward and uncomfortable, “table maneuvers” used to manually position patients’ head for diagnosis and treatment. Adding Epley Omniax to our existing diagnostic testing enables our doctors of audiology to differentiate between various related disorders, and to accurately assess and treat all six semicircular canals (three in each ear) of the vestibular system. The chair’s multi-axial rotation is gently controlled to efficiently reach, study and review every point of the inner ear. Greater ease and comfort. Accurate results. Highest quality care. Rather than laying down for manual maneuvers, patients treated with Epley Omniax sit comfortably in a softly-padded chair. Electronically controlled (360°) rotation allows Institute staff to move patient and chair into any position for diagnosis and treatment. This multiple repositioning capability helps the doctors of audiology identify and treat issues that may go undetected with traditional table methods. What can I expect from my dizziness and balance test? Your doctor of audiology will assess every component of your hearing and balance system in order to identify the cause of your hearing, dizziness or balance disorder. Together with your doctor of audiology, you’ll review and discuss medical history and additional questions about past illnesses, noise exposure, dizziness and any other elements of your medical history that may have had an impact on your steadiness. The Patient History and Dizziness Questionnaire you completed and provided, along with the Dizziness Handicap Assessment are important to this process. Following a review of your medical history, the audiologist will perform a complete diagnostic vestibular and balance evaluation. Together these crucial steps make up the audiological evaluation. Following the assessment, you’ll receive a working diagnosis and appropriate therapy approach. The test results determine how components of your balance systems are functioning and which systems may be involved. What can I expect from my hearing test? Together with your doctor of audiology, you’ll review and discuss your medical history and additional questions about past illnesses, noise exposure, and any other elements of your medical history that may have had an impact on your hearing. a screening of the health of the inner ear known as otoacoustic emissions. All tests performed are non-invasive and essential to the overall evaluation of your hearing. The next step is to evaluate your hearing through important speech frequencies revealed while in a sound booth. You will insert earphones and wear a head band known as a bone oscillator. Then, you will press a button when you hear very soft tones. The second portion of the test evaluates your ability to detect and understand speech. Following the testing, your doctor of audiology will review your results and recommend the necessary intervention, which may include medical referral, hearing devices or additional testing. At what age should my baby’s hearing be tested? Your infant should have a hearing screening within the first month of life. Most hospitals conduct newborn hearing screenings onsite during your stay and before you take your baby home. If there is a concern following the hearing screening results, diagnostic testing can comfortably be done at either of our Institute locations, to confirm earlier findings, or to rule out a hearing loss. If you are unclear whether your baby received a hearing screening, ask your doctor or the facility where your baby’s records are located. Two hearing tests are used to screen babies. Neither test requires that your child is awakened from napping or sleeping. It’s perfectly acceptable to keep them comfortable and resting. Our doctors of audiology will be able to record the needed information from your baby. The first test is called an otoacoustic emissions (OAE). This test evaluates how portions of the ear respond to sound. An earphone is gently placed into your baby’s ear and sounds are presented at different pitches and a response from the ear, similar to an “echo” is measured. If there is no measurable echo, it could indicate a hearing loss. The second test is known as an auditory brain stem response (ABR) test. This test evaluates how the part of the nerve carrying sound from the ear to the brain (the brainstem) is responding to different sounds. Earphones and electrodes are gently placed on your baby’s ears and around the head. The doctor of audiology then presents sounds through the earphones and through sophisticated equipment, measures the levels of electrical activity indicated in your child’s brain that are responsible for responding to the presented sounds. Why is it essential to have my baby’s hearing screened as soon as possible? Time is of the essence. Studies show the most important timeframe for a child to learn language is during the first six months to three years of life. Children who are identified with a hearing loss and receive the appropriate intervention acquire better language skills than those who do not. The sooner a hearing loss is identified, the faster your baby will benefit from strategies and technology that may assist him or her with communication. How can I recognize hearing loss during early childhood? Although newborn hearing screenings and follow-up screenings are designed to identify hearing losses present at birth, some hearing losses do not develop until later in a child’s life. It is important to notice expected auditory milestones as your child grows. If my child has a hearing loss, what can be done? Many strategies and assistive devices are available for children who have a hearing loss. By addressing the needs, you can take advantage of advancements in technology providing more options than ever before. Our Institute doctors and support staff can help you to determine which devices are most appropriate, and provide you education and resources as well. Call the Institute today at (949) 274-8399 to learn more about our pediatric screening, care and intervention programs. If you have any concerns about your child’s hearing for any reason, please talk to your doctor, or call us. Two year-olds understand more words than they can speak. A two-year-old understands approximately 300 words. According to the Hearing Loss Association of America, 48 million Americans experience some form of hearing impairment. In fact, 60% percent of adults ages 21- 65 suffer mild to acute hearing loss. Yet only a small percentage of physicians routinely screen for hearing loss. And only 1 in every 5 who could benefit from hearing device intervention actually seek help. If you’re among those with hearing loss, it’s time to stop suffering. Our Institute and doctors of audiology are among a very select group trained and certified to prescribe and fit the Lyric extended wear hearing device. Call the Institute today at (949) 274-8399 to find out if Lyric is right for you. The device is 100% invisible. It is discreetly and gently placed deep within the ear canal by your highly-skilled doctor of audiology. You can wear it indoors or outside. You can even shower with Lyric, unlike more traditional devices. No one will know you have it, that is, unless you tell! Our Institute doctors are specially-trained professional audiologists with extensive Lyric custom fitting and product expertise. Lyric’s sophisticated technology delivers the sounds of voices, music and phone conversations with improved fidelity and clarity. Lyric is designed to closely mimic the way you hear naturally, using your outer ear to naturally direct sound into the ear canal. According to surveys conducted by Phonak, the maker of Lyric, 88% of Lyric users report that it provides more natural sound quality than their previous hearing aid. To ensure maximum benefit from Lyric, we provide follow-up care. According to the Hearing Loss Association of America, 48 million Americans experience some form of hearing impairment. In fact, 60% percent of adults ages 21- 65 suffer mild to acute hearing loss. Yet only a small percentage of physicians routinely screen for hearing loss. And only 1 in every 5 who could benefit from hearing device intervention actually seeks help. Dr. Mango and our Institute doctors of audiology are among a very select group of audiologists trained and certified to offer and fit the Opn hearing device. Call the Institute today at (949) 274-8399 to learn about the possibilities with Opn, and to find out if it’s right for you. Opn adjusts and balances all the sounds surrounding the user, not just the sounds directly in front. It scans the environment 100 times per second to analyze and balance every sound individually, and separates speech from noise to help focus on what’s important. Opn is the first-ever hearing aid-type device connected to the Internet. It allows high-quality sound for better listening in all environments, Users can connect to devices such as smartphones, computers, and TVs. It connects with just a tap of the fingertips, streaming audio directly to the hearing device. Opn uses the powerful Velox™ platform specifically designed for hearing devices to process all the layers of sounds around you exceptionally fast, without delays and with less stress on your brain. Tt also features BrainHearing™ technology that helps the brain actually understand speech patterns better in complex listening situations. That allows a greater focus on the conversations you desire. Opn users experienced 20% less listening effort when trying to understand speech. Additional studies show that Opn users are able to remember 20% more of what is said. In testing, Opn substantially increased speech understanding, one of the most important parameters for users. To ensure maximum benefit from Opn, we provide follow-up care. This is a personalized neuroscience-based sound therapy for use in the temporary relief of tinnitus symptoms. It is FDA-approved and designed to improve the quality of daily life for those with tinnitus. First, our doctors of audiology use the system to identify and map each individual’s unique sound print. Then, patients listen nightly to a customized therapy using the Levo System while sleeping. Progress is tracked over time, and therapy can be further adjusted and personalized. 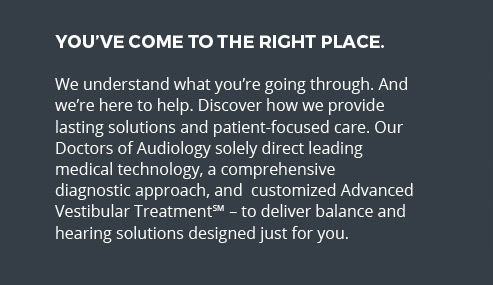 Our doctors of audiology offer comprehensive programs that can provide long-term relief, thoughtfully guided under the care of our trained audiologists. Significant relief can be achieved through customized treatment options. All Neuromonics devices are programmed with a customized tone that desensitizes patients to the sounds of tinnitus. These include on-the-go, on-demand options. LYRIC™ extended wear hearing device additional information, including patient testimonials. Opn™ learn more about the capabilities of this Internet-capable hearing device. We proudly support these organizations and they offer additional resources for clinicians, patients, caregivers and families. ACADEMY OF DOCTORS OF AUDIOLOGY offers programming and support to audiologists and students who serve their audiences as independent practitioners. AMERICAN ACADEMY OF AUDIOLOGY is the world’s largest professional audiological organization. AMERICAN TINNITUS ASSOCIATION is the nation’s foremost organization working to cure tinnitus (ringing in the ears). BALANCEANDMOBILITY.COM is presented by Natus Medical Incorporated and NeuroCom® Balance Solutions. This site provides both patient and clinical information on balance disorders and treatment options. National Institute of Deafness and Other Communication Disorders is part of the NATIONAL INSTITUTES OF HEALTH (NIH). They conduct and support biomedical and behavioral research and research training related to hearing, balance, smell, taste, voice, speech, and language processing. The HYPERACUSIS NETWORK is dedicated to educating and helping those afflicted with hypersensitive hearing or tolerance. VESTIBULAR DISORDERS ASSOCIATION (VEDA) provides related information, education and a support network focused on the diagnosis and treatment of vestibular dysfunction and balance disorders. Their online store offers many publications about vestibular disorders. A graph depicting the ability to hear sounds at different frequencies and used to provide a detailed description of hearing ability. It can be described as a picture of your sense of hearing. It illustrates hearing ability by showing hearing threshold (how soft a sound gets before becoming inaudible) at various frequencies. Computerized, pure-tone audiometry to precisely measure hearing acuity, speech-recognition thresholds and word-recognition thresholds. Allows the doctor to test hearing in a frequency range 250 to 8,000, but can expand to 20,000 Hz. The patient sits in a comfortable, soundproof booth. They’ll wear a set of specially calibrated headphones and listen to a series of very quiet beeps. Next, the audiologist will read a series of words over the headphones, and the patient repeats the words. After the tests are completed the doctor reviews and interprets the audiogram. Those findings will be discussed with the patient. A doctor of Audiology; trained in the science of hearing and hearing impairments that can administer tests and provide rehabilitation. 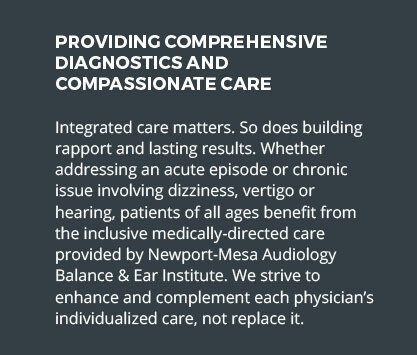 All Newport-Mesa Audiology Balance & Ear Institute doctors of audiology have their Au.D. designation, are Board-certified, and are skilled to treat adults and children of all ages. The science of hearing. The profession dedicated to the diagnosis and rehabilitation of hearing loss. A subspecialty focuses on balance disorders with symptoms such as dizziness and vertigo. The measurement of hearing acuity. The nerve carrying electrical signals from the inner ear to the base of the brain. The outer flap of the ear. Also known as the Pinna. A medical condition that causes dizziness or unsteadiness even when holding still or lying down. There are more than a dozen types. Thin sheet of material which vibrates in response to movements in the liquid that fills the cochlea. The conduction of sound waves through reverberations of the mastoid bone to the inner ear. The cavity in the skull which contains the inner-ear mechanism. Measures hearing sensitivity without requiring responses from very young patients or persons who are unable to communicate. Closed Captioned. A broadcast television program may include a signal which produces descriptive subtitles on the screen. Requires a CC converter. Shaped like a snail’s shell, this organ of the inner ear contains the organ of Corti, from which nerve fibers send hearing signals to the brain. Replacement of part or all of the function of the inner ear. Hearing loss caused by a problem of the outer or middle ear, resulting in the inability of sound to be conducted to the inner ear. Hearing loss that is present from birth which may or may not be hereditary. That surface of the brain where sensory information is processed. Sensory cells within the semicircular canals which detect fluid movement. Tiny crystals are found within the inner ear. The crystals make you sensitive to gravity and help you to keep your balance. Normally, a jelly-like membrane in your ear keeps them where they belong. If the ear is damaged the crystals can shift to another part of the ear. When they’re out of place, the crystals make you sensitive to movement and position changes that normally don’t affect you, sparking vertigo. A jelly-like covering of the sensory hairs in the ampullae of the semicircular canals which responds to movement in the surrounding fluid and assists in maintaining balance. Measurement of frequency, or a sound’s pitch. Measurement of the volume or loudness of a sound. A range of specialized audiological, vestibular, imaging and other investigations to support an accurate diagnosis for possible causes of dizziness and imbalance. The sensation of being off balance. Feeling off balance or ‘tilted’ toward one side, may be accompanied by frequent fall in one direction. Feeling of lightheadedness; unsteadiness and imbalance sometimes associated with fainting. Results when the brain has conflicting messages from the ear and other senses. Does not involve the feeling that either you or something in your environment is moving (please see Vertigo) Dizziness is often misunderstood, often described as a medical condition in a non-specific way before a comprehensive evaluation establishes a precise diagnosis. Abrupt without warning; patients risk serious accidental injury. The short tube which conducts sound from the outer ear to the eardrum. Membrane separating outer ear from middle ear: the tympanum. Ear, nose and throat physician specialist (also Otolaryngologist) trained in the medical and surgical management of disease. May see patients for: hearing loss, ear disorders, nerve disorders, allergies, infections, growths and tumors injuries, congenital or acquired abnormalities, swallowing, sleep, or speech disorders. Treatment for BPPV that involves guiding the patient’s head into a series of positions designed to move dislodged crystals out of the semi-circular canals of the inner ear. designed to precisely diagnosis and treat positional vertigo, including BPPV and it many variants. Patients with classic BPPV can experience dramatic relief of symptoms in as little as one session. Tube running from the nasal cavity to the middle ear. Helps maintain sinus and middle ear pressure, protecting the ear drum. The number of vibrations per second of a sound. One of three bones of the middle ear that help transmit sound waves from the outer ear to the cochlea. Also known as the Malleus. An indication of how soft a sound may get before it is inaudible. A hearing threshold of 0-25 dB is considered normal. A collapsed tolerance to normal environmental sounds, or hypersensitive hearing. Imbalance or disequilibrium is a term used to denote difficulty maintaining one’s center of gravity in a set position. Rather like dizziness, it is a non-specific term which may be due to a wide spectrum of disorders. Imbalance is not a specific diagnosis but generally refers to a type of medical problem. Test for measuring the ability to hear sound waves transmitted through bone. One three bones of the middle ear that help transmit soundwaves from the outer ear to the cochlea. Also known as the Anvil. he portion of the ear, beginning at the oval window, which transmits sound signals to the brain and helps maintain balance. Consists of the cochlea and vestibular apparatus. Pre-syncope. Feelings like you’re going to faint or pass out; usually occurs with quick changes in position while dehydrated, or with cardiovascular disease. Within the organs of balance, area containing sensory cells which measure head position. One of three bones of the middle ear that help transmit sound waves from the outer ear to the cochlea. Also known as the Hammer. The bone in which the entire ear mechanism is housed. Part of the larger temporal bone. The portion of the ear between the eardrum and the oval window which transmits sound to the inner ear. Consists of the Hammer, Anvil and Stirrup. May be 2nd of most common causes of vertigo, especially in women. About 40% of migraine patients have vertigo before, during or after a headache, or even unrelated to headache. Episodes likely to be more severe, longer lasting, and more frequent than those of BPPV. Triggers may bring on episodes. Characterized by nausea, vomiting, pallor and sweating when traveling in a moving vehicle. It is a physiological response to a mismatch between vestibular and visual information about the moving environment. Commonly associated with any type of dizziness or imbalance. A term used to differentiate inner-ear problems from those of the middle ear. The brain’s ability to adapt and constantly learn new things. N-I-H-L; damage to the sensory hair cells in the inner ear. Can be caused by prolonged exposure to loud noise, or exposure to a single loud noise. An involuntary eye movement; seen in many types of balance disorder. The organ located in the cochlea. Contains hair cells that transmit sound waves from the ear through the auditory nerve to the brain. The illusion that the environment is moving. Bobbing oscillopsia is a condition when objects or the horizon appear to jump or bob up and down spontaneously when the subject is walking or running. Collective name for the three bones of the middle ear: Hammer, Anvil and Stirrup. A surgical specialty of the ears, nose and throat. Stone-like particles in the macula which aid in our awareness of gravity and movement. ranch of medicine concentrating on diseases of the ear. A conductive hearing loss caused when the middle ear no longer transmits sound properly from the eardrum to the inner ear. hemicals that are damaging to hearing, can cause tinnitus and/or can affect balance. Some medications, such as aspirin, several types of antibiotics, anti-inflammatories, sedatives, anti-depressants and quinine medications can negatively affect hearing health and cause tinnitus. The external portion of the ear which collects sound waves and directs them into the ear. Consists of the pinna (auricle) and the ear canal and is separated from the middle ear by the ear drum. The membrane that vibrates, transmitting sound into the cochlea. Separates the middle ear from the inner ear. Watery liquid that fills the outer tubes running through the cochlea. The outer, visible part of the ear, also called the Auricle. Conditions in which sudden change of head position (such as lying down) or dizziness looking upwards at a high shelf) induce. Hearing loss that develops as part of the natural aging process. It is considered a hereditary sensory-neural hearing loss. The cochlea and other parts of the ear deteriorate. Tinnitus may occur. Inner ear area which contains some of the organs that measure position and gravity. Curved tubes containing fluid, movement of which makes us aware of turning sensations as the head moves. Hearing loss resulting from an inner ear problem. Alternating low and high pressure areas, moving through the air which is as interpreted as sound when collected in the ear. One of three bones of the middle ear that help transmit sound waves from the outer ear to the cochlea. Also known as the Stirrup. One of three bones of the middle ear that help transmit sound waves from the outer ear to the cochlea. Also known as the Stapes. Thin strip of membrane in contact with sensory hairs which sound vibrations move producing nerve impulses. In the organ of Corti. The sensation of a ringing or buzzing in the ears when no other sound is present. Subjective tinnitusis the most common; 99% of all cases. Because the noise is caused by a malfunction of the inner ear, no sound waves are involved and only the affected person can hear the noise. Objective tinnitusaccounts for less than 5% of all cases. Usually involves sounds are detectable by others. For example, those who hear a whooshing sound with each heart beat may have pulsatile tinnitus, a condition their physician can hear with his stethoscope. Phone device-enabled; dialogue is achieved at any distance as words, typed into a TTY, are converted to phone signals and appear, or are printed, as words on a receiving TTY machine. Examination to assess the condition and mobility of the ear drum. This examination indirectly tests for holes in the ear drum, a partial vacuum behind the ear drum, fluid behind the ear drum and the function of the Eustachian tube. Membrane separating outer ear from middle ear. The Eardrum. Sensation that you or your surroundings are moving or spinning while sitting or lying still. Vertigo can be associated with nausea and vomiting. This false sense of rotation is due to a variety of causes. Vertigo is a symptom, not a disease. The most common type is B-P-P-V or Benign Paroxysmal Positional Vertigo. Vertigo implies that there is a rotational component to your dizziness – either the room is spinning around you or you are spinning in the room. This is the response of central nervous system (and body) to prolonged vestibular activity. As part of the cochlea concerned with maintaining balance. Various strategies used by a patient to reduce symptoms. Known as videonystagmography. The machine has a set of goggles connected to a computer. They analyze the way the eyes beat, the rapid eye movement that happens when the eye attempts to see something in the periphery of vision and then jerks back to the center of vision. A distance between the peaks of successive sound waves. A sound, such as running water, which masks all speech sounds.